National Societies take all necessary steps to protect and promote the organization’s visual identity and that of its staff and volunteers. To reduce the risks faced by a National Society when carrying out its humanitarian work in sensitive and insecure contexts and to increase its acceptance and access, it is crucial that its staff and volunteers, as well as its vehicles and buildings, be clearly identified and easily distinguished from others. They must also be easily recognized and associated with the National Society and its independent, neutral and impartial humanitarian action. Together, these factors will contribute to the instant recognition of the National Society and respect for its humanitarian mandate. Internal guidelines on the proper display of the emblem and of the National Society’s logo and visual identity are an essential tool. When applied consistently, such guidelines will reinforce recognition of the National Society within the community and by armed and security forces, as well as by other key stakeholders, which in turn will enhance its safety and access. National Societies may seek to further strengthen their distinct visual identity through other means, such as wearing distinct uniforms. The internal guidelines should include a section defining the conditions of display of the emblem and of the National Society’s logo in the context of the Society’s partnerships with external actors. Should instances of misuse of the emblem(s) be observed, whether in peacetime or in armed conflict, the National Society should act immediately in support of the public authorities to stop the abuses and restore respect for the emblem or emblems. Taking such measures has long been recognized as part of a National Society’s auxiliary role to the public authorities in the humanitarian field. Stop emblem misuse; establish a permanent system to support the authorities in preventing further abuses. Distinguish yourself by adopting unique and clearly visible uniforms and other identity features. Promote your identification and visibility features among key stakeholders and the public at large to reinforce instant recognition. Develop and apply internal identification guidelines that include a section outlining regulations on the joint display of visual identification devices. Ensure the coherent and coordinated display and promotion of Movement visual identification devices . One of the key factors contributing to a National Society’s safe access in sensitive and insecure contexts, including armed conflict and internal disturbances and tensions, is the clear and distinct identification of its staff and volunteers, buildings, vehicles and other property. Means of id entification may take different forms. These include: the marking of persons and objects with the distinctive emblems of the 1949 Geneva Conventions and their Additional Protocols or with the National Society’s logo; the wearing of uniforms; the carrying of identity cards; and the use of distinctive radio or electronic signals. 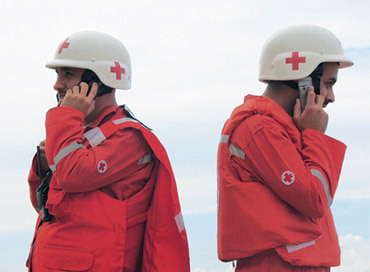 Although each component of the International Red Cross and Red Crescent Movement (the Movement) operates autonomously and conducts its humanitarian services in its own name, we are all united by the Fundamental Principles, by our shared commitment to the Statutes of the Movement and its agreed policies and rules, and by our common use of the distinctive emblem. The world often views us as one organization, and the actions of one Movement component can have a direct impact on the reputation and security of another. As part of the Red Cross and Red Crescent “family”, we have a visual identity that is inherently linked with how we carry out, and communicate about, our humanitarian activities at the individual, collective and organizational level. 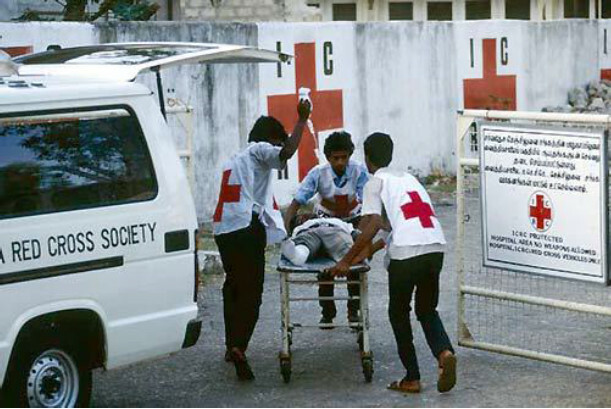 The red cross and red crescent emblems are among the most recognized, respected and trusted symbols in the world. First and foremost, they are the visible signs of the protection afforded to armed forces medical services and authorized civilian medical services in times of armed conflict. They are also the symbols of the neutral, impartial and independent humanitarian action carried out by the Movement and its respective components. The respect associated with the emblems is today undeniable, and the identity of the components of the Movement is inseparable from them. In armed conflicts, the emblems are the visible sign of the protection conferred by the Geneva Conventions and their Additional Protocols on relief workers and on medical personnel, facilities and means of transport. In such cases, the emblems should be as large as possible and should be displayed with no other information. When used indicatively, the emblems show the link that a person or an object has with the Movement. In such cases, the emblems should bear additional information (e.g. the name or the initials of the National Society). The emblems must be of small dimensions and may not be placed on armlets or on the roofs of buildings, in order to avoid any confusion with the emblems used as protective devices. Improper or unauthorized use of the red cross or red crescent emblems in peacetime or in other situations can seriously undermine the image, reputation and acceptance of the National Society and of other Movement components. This is the case in particular for National Societies working in sensitive or insecure contexts. Misuse of the emblems or of the logos of Movement components may blur our identity and distinctiveness. Being confused with others, whether it is with the public authorities, the armed forces or with external organizations which may not be working in a neutral, impartial or independent manner, can have serious repercussions on the safety of personnel and can jeopardize our safety and access to beneficiaries. Who is entitled to use the protective emblem? with the express authorization of the government and under its control, civilian hospitals, civilian medical units and vehicles, and their staff, including those of National Societies and other voluntary aid Societies, assigned to the treatment and transport of the wounded, sick and shipwrecked. The ICRC and the International Federation may use the emblems at all times (in peacetime as well as in times of armed conflict) and without restriction. What are common forms of misuse of the emblems? To promote the correct use of the emblem, it is essential that there be a national law regulating the use and protection of the emblem in all situations, including in peacetime. Such a law will also serve as a reference for the National Society to guide its use of the emblem, and as a basis on which to develop a strategy to ensure respect for the emblem and to protect it from misuse by others. National Societies have a particular responsibility and role under the Statutes of the Movement to support their public authorities in their obligation to ensure that the emblem, as well as the National Society’s own logo and name, are known and respected at all times. In addition to our responsibility to display the emblem and our respective logos correctly and consistently, it is important to ensure they provide the distinctiveness and visibility required. A National Society’s means of visual identification displayed on its personnel’s uniforms and other items of clothing, buildings, transports and other assets must elicit an automatic association with the Society’s purely humanitarian mission and mandate, an understanding that the services are provided impartially to all those in need, and that the providers are neutral, independent, and do not take part in the violence. The display of the emblem is only the external or visual expression of the protection that is due to protected persons and objects under international humanitarian law (IHL): the staff and volunteers of a National Society duly authorized to display the protective emblem in accordance with IHL are protected irrespective of whether or not they are displaying the emblem. However, National Societies may consider the use of consistent supplementary means of identification to reinforce their distinctive identity. This in turn will contribute to safer access of their staff and volunteers. See examples below. It has been observed that, in practice, a number of National Societies carrying out their humanitarian activities in sensitive and insecure operational contexts, including armed conflict and internal disturbances and tensions, display the indicative emblem (normally in the form of the National Society logo) in a large size, in particular on personnel and vehicles. These activities do not fall within the National Society’s role as an auxiliary to the medical service of the armed forces (although they may well be carried out as part of the National Society’s broader role as an auxiliary to the public authorities in the humanitarian field). Displaying a large logo may, in certain circumstances, enhance the visibility and distinctiveness of the National Society and contribute to its ability to carry out life-saving humanitarian activities. This practice should, however, only be resorted to with restraint as it may create confusion with the protective emblem. It also does not conform strictly to the letter of the Conventions and is not fully covered by the 1991 Emblem Regulations. It would therefore seem necessary for each State to determine, with its National Society, whether such a practice is permissible in the national context and, at a minimum, such use must not be prohibited by national legislation. Also of importance is the need to carefully consider the joint display of visual identification when engaging in partnerships. Such display should remain exceptional and discreet and should not create any confusion. When partnering visibly with another organization, you assume their identity to a certain extent, and therefore must be concerned with their reputation and whether or not they share our values and principled approach to the provision of services. Internal regulations or identification guidelines and enforcement systems are useful to guide the consistent and correct use of the emblem within the National Society, such as the display of the logo on clothing, personal identification documents (with photo and expiry date), products, premises, equipment and means of transport. When applied, these measures will reinforce a common recognizable image of the National Society, thereby increasing its acceptance, security and access. The 1991 Regulations on the use of the emblem by the National Societies commit a National Society to adopt internal regulations governing the use of the emblem in regulations or internal directives and provide an outline of the issues such a tool should cover. See Article 7 of the 1991 Emblem Regulations. A National Society should also designate a focal point or department entrusted with advising it on the display of the emblem and its logo in all of its activities, including in its partnerships with external actors. To learn more about the actions and measures linked to this element, and to access tools and shared experiences, see the relevant section below, and click on the Safer Access in Action map highlighting individual National Society accounts of the actions and measures they took when operating in sensitive and insecure contexts. Is an emblem law in place in your country and is it known within the National Society and by key stakeholders? How is it enforced? Which ministry or national authority is entrusted with overseeing the protection of the emblem and how does it carry out this responsibility? Are instances of emblem misuse common in your country or context and could this jeopardize the safety and security of your personnel and volunteers? If so, what system and procedures do you have in place to support the public authorities in monitoring instances of misuse and in eradicating misuse? Who advises your National Society personnel on its consistent identification and use of the emblem and National Society logo? Do you have internal regulations or guidelines and systems in place and how do you promote and monitor their adherence and respect? How are your response staff and volunteers identified? Do they wear distinct uniforms marked appropriately with the National Society logo or the emblem in accordance with your guidelines? Are the public aware of your visual identity? If a uniform, tabard/bib or vehicle is misplaced or stolen, how do you track and report it to the authorities so that the identity of the perpetrator is not confused with yours? What form of personal identification do your staff and volunteers carry with them? Does it clearly identify each individual and associate him or her with the National Society? Does it contain a photo and expiry date? How are your buildings marked? Is their identity clear and consistent? How do you regularly share your GPS coordinates with the parties to the conflict when appropriate? How are your vehicles marked? Are they consistently displaying the logo/emblem as appropriate for the context and do they also bear other distinctive markings to ensure they are not confused with others, including those of the armed forces? In what way do you ensure your identity is widely known by those who can influence the security and access of your teams, such as community members and other key stakeholders, including the public authorities and armed and security forces? Knowledge of the emblems, their respective functions and the conditions of their display is promoted among key stakeholders, including armed forces and groups, among medical professionals and more broadly within the community. Internal National Society guidelines and systems have been established and implemented to support the consistent and correct use of the emblem and of the National Society’s logo on clothing, personal identification documents, products, premises, equipment and means of transport. Visual identification practices (high vs low visibility) that comply with Movement regulations and enhance acceptance, security and access have also been adopted. Consideration should be given to the implementation of a control system such as serial numbers that tracks work clothing and identification in order to prevent its misuse by non-Movement entities. In conformity with established mechanisms to guide the formation of partnerships (see 3.8), any joint display of visual identification should remain exceptional and discreet and should not create confusion. Such considerations are paramount in sensitive and insecure contexts.